The group involved in the design and implementation ogf test fixture, taking advantage of an internal specialized workshop SCM (Seica Custom Manufacturing), is capable of meeting any requests coming from the field. In fact, both ICT, standard or complex bed of nails, i.e., equipped with mechanical and/or pneumatic movements, as well as elaborated test fixtures conceived for functional tests. 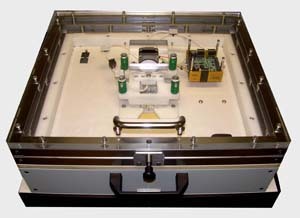 These include, for example, the fixtures including the RF testing with shielded chambers, and the fixtures with on-board camera for visual inspection of specific areas. Via several CAD converters, developed directly by Seica, the information required for fixture drilling (performed with NC machines) and for automatic creation of test programs. In case the CAD data are not available, the data can be obtained directly upon board analysis, for example, using the cameras delivered with the flying probers. In order to create specific housings, and dedicated nose pads to contact the most complex fixture connectors, also the mechanical drawings of the U.U.T. are used.